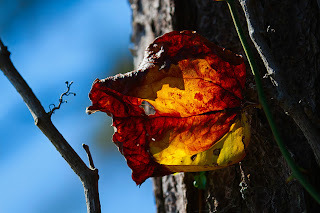 This drying leaf caught my eye while walking a trail at Chincoteague State Park. The HDR was created with three exposures using 2ev spacing. Merged and tonemapped with Photomatix Pro 4. Final processing to add contrast and color was produced using Photoshop 5.